A myriad of banners hang from the rafters of Thompson-Boling Arena, reminding all who enter its corridors of eight national titles, 18 Final Four appearances, and 38 total NCAA Women’s Tournament appearances – one for each year since the tournament’s inception. Dripping with tradition, the University of Tennessee Lady Vols basketball program has flooded the sporting world with accomplished athletes, coaches, analysts, and athletic executives. One such player-turned-coach poises herself to take a position seldom vacated: head coach of the Lady Volunteers. Sparta native Kellie Jolly Harper, who played for Tennessee from 1995-1999, understands the almost mystical importance of the Lady Vols program that lingers in the minds and hearts of fans, players, coaches, and opponents. She won three national championships at Tennessee under legendary head coach Pat Summitt, assisting the likes of Chamique Holdsclaw and Tamika Catchings on the undefeated road to the 1998 title game in which she scored 20 points of her own. She only experienced 17 losses as a collegiate athlete. Her competitiveness as an athlete earned the respect of many including fellow classmate Peyton Manning. Her history as a coach, however, has some fans and analysts on edge about the hire. During her tenure at North Carolina State, making the jump from the ranks of the Southern Conference at Western Carolina to the ACC, her conference record stood at just 23-39 overall before her termination in 2013. Harper seems to have learned from her experiences, taking the Missouri State Lady Bears to the Sweet Sixteen this past season after starting the season 1-7. Harper’s accomplishment earned her the Kay Yow Coach of the Year award, honoring her late NC State predecessor. But how does coaching in the Missouri Valley Conference translate to the Southeastern Conference, in which Harper has not acted as a coach since serving as an assistant at Auburn from 2000 to 2001? Does a national champion player make a national champion coach? Summitt maintained that anything worth doing should be done with passion. She remained vocal on the sidelines, encouraging her team and calling out players – and officials – when they made mistakes, earning notoriety for her piercing glare and dignified but never demure demeanor. She demonstrated her passion for the game and for her state with each practice, game, youth camp, and speaking engagement. She even went so far as to demand a plane return to Knoxville so her son, Tyler, would be born in Tennessee. While Harper may not make many demands of pilots, she will bring a similar passion to Rocky Top. Many fans and reporters draw comparisons between the two, including longtime Lady Vols chronicler Maria Cornelius. Harper’s passion for victories builds a base for progress in a program with seemingly waning wins, one that earned a record of 19-13 overall and a losing 7-9 mark in SEC play in 2018-19. Her similar stare might not hurt either. Following this idea proves feasible for Harper, who has both played and coached with renowned talents including Missouri State assistant Jackie Stiles, the first NCAA Division I women’s player to score more than 1,000 points in one season. Harper’s husband, Jon, has served on each staff in her head coaching career. She will presumably keep him on staff at Tennessee, with Jon Harper reporting to another individual in the athletics department as not to break Tennessee’s 1980 nepotism law involving direct supervision, including higher education roles. The spouse model has worked well on Rocky Top for co-coaches of Tennessee Softball Ralph and Karen Weekly, who have led the Lady Vols to five top-three appearances in the Women’s College World Series since 2002. As long as Harper assembles a proven staff, her chances of succeeding in the SEC remain feasible. In the same loyalty maxim, Summitt notes family business models succeed because they foster loyalty and trust. Harper wore the orange and white. She played in Thompson-Boling Arena. She walked the same hills her players walk and sat in the same classrooms where they learn and serve as ambassadors for athletics. She is a “Lady Vol for Life,” a member of the Big Orange Family. Following a first round NCAA Tournament loss to her alma mater as a first-year head coach at Western Carolina in 2005, Harper expressed her loyalty to the program. Harper’s commitment to the program as a former player and disciple of Pat Summitt bodes well for earning the trust of her players and community on Rocky Top. 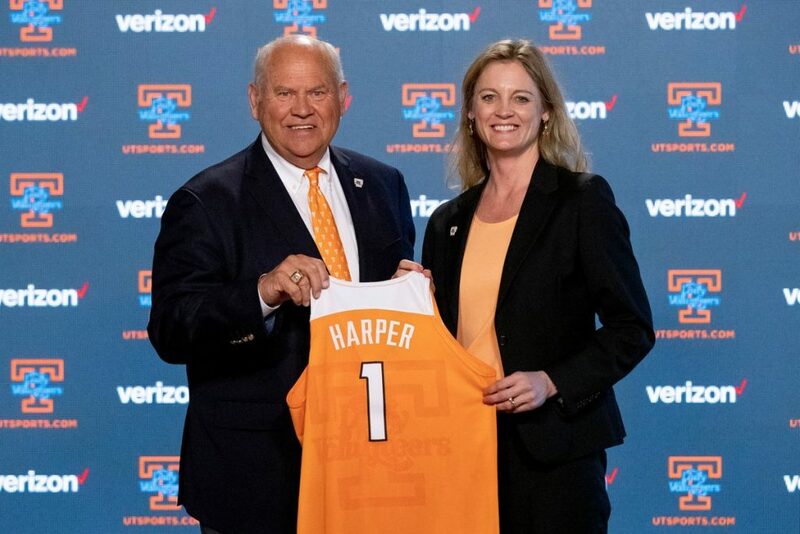 Coaches without support rarely succeed, but Harper knows Tennessee as “home, sweet home.” Her Tennessee ties came through in the interview process, earning the respect of the man many consider to be a modern “Godfather” of Tennessee Athletics. In 2016, Harper broke her team’s protocol by wearing Tennessee orange to a media engagement upon Summitt’s death. She remains committed to her alma mater and to her coach, one she never would hope to disappoint. Harper knows her way around a court. She scored 894 points as a Lady Vol and dished out 452 assists, blazing a trail with a fast-paced offense that became a hallmark of the Lady Vols in the late 1990s. Summitt praised her former point guard in her 2012 book “Sum It Up” co-authored by sports columnist Sally Jenkins, saying “[Harper] invariably called the right play at the right moment, and sent the ball to the right place…” Summitt also noted Harper always listened, gleaning advice and acting on what she was told. Harper’s willingness to listen as a player undoubtedly gives credence to her wisdom as a coach, having learned from one of the winningest coaches in the history of any sport. Her knowledge of the game, the program, and the university perhaps give her more insights than other touted candidates previously unaffiliated with the Lady Vols. At the very least, Tennessee Athletics trusts her knowledge. Harper acknowledges she brings her own wisdom to the game, but she also acknowledges her teacher. Any coaching hire brings a token of anxiety. But winning starts with a winning attitude, and Harper brings hope to a tradition ready to reemerge – a tradition of winning with poise created by and for Lady Vols.